The Clinical Cooperation Unit (CCU) Neurooncology is a cooperation of DKFZ and the Heidelberg University Hospital Neurology Department. It is strongly linked to the CCU Neuropathology (Andreas von Deimling), the CCU Neuroimmunology and Brain Tumor Immunology (Michael Platten) the Junior Groups of Brain Tumor Metabolism (Christiane Opitz) and Molecular Mechanisms of Tumor Cell Invasion (Björn Tews) and the experimental imaging departments at both the Head Clinic (Martin Bendszus) and the DKFZ (Alexander Radbruch). Tight collaborations and a structuring role exist with/for the Neurooncology working group of the German Cancer Society (NOA; chair: Wolfgang Wick), the European Association for Neuroonolcogy (EANO; president: Wolfgang Wick) and the Brain Tumor Group of the European Organisation for Research and Treatment of Cancer (EORTC). The overarching goal of our research is to understand the tumor biology of brain tumors and to rapidly translate these insights into clinical application. The team around Frank Winkler (DFG funded Experimental Neurooncology Group) applies intravital microscopy with the main aim of unraveling growth and resistance patterns of glioma as well as critical steps in the formation of brain metastases and brain metastasis-brain-microenvironmetal interactions (Osswald Nature 2015). 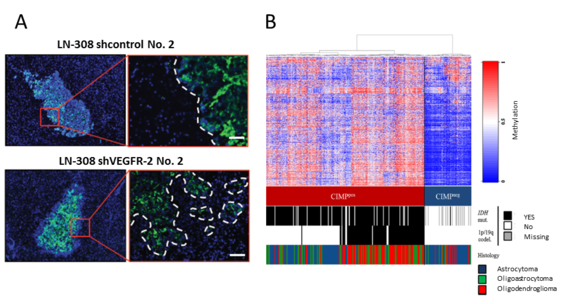 Other CCU members investigate intrinsic glioma treatment resistance and contribution of the glioma microenvironment to resistance. Current projects focus on understanding the molecular mechanisms of targeted therapies in glioblastoma, such as APG101, a soluble form of CD95, and on defining resistance signaling pathways, and mTOR/NDRG1/MGMT signaling for alkylating therapy (Weiler, Blaes PNAS 2014, Wick Clin Cancer Res 2014). Towards understanding the interaction between molecularly defined treatments and different qualities of radiation, we have developed the NCT Neuro Master Match (N2M2) trial (funded by Deutsche Krebshilfe, NCT 3.0 and DKFZ HIPO). N2M2 is an open label phase I/II umbrella trial for patients with newly diagnosed glioblastoma without MGMT promoter methylation. It aims at demonstrating safety, feasibility and preliminary efficacy (decision for future randomized phase II/III) of treatment with targeted compounds in addition to radiotherapy based on thorough molecular characterization. Research done in collaboration with the Neuroradiology, Neuropathology, Proteomics and Epigenetics groups at DKFZ (funded by the Federal Ministry of Education and Research (BMBF) and Deutsche Krebshilfe) focuses on the development of diagnostic, prognostic and predictive biomarkers in anaplastic glioma and glioblastoma (Wiestler, Acta Neuropathol 2014; Capper Acta Neuropathol 2013; Wiestler Acta Neuropathol 2013; Wick Neurology 2013; Sahm Blood 2012). It builds on large randomized trials that have been coordinated by the clinical neurooncology program (Chinot, Wick NEJM 2014; Wick. ASCO 2016). Studies on immunotherapies for brain tumors investigate checkpoint inhibition and personalized active immunotherapy based on next generation sequencing and target evaluation on the X-PRESIDENT platform (developed by immatics, Tübingen) as well as IDHR132H directed peptide-based immunotherapy for patients with newly diagnosed malignant gliomas (Schumacher Nature 2014, Bunse J Clin Invest 2015). Own immunotherapy projects are done in the area of checkpoint inhibition targeting B7H3 (PD-L3) aiming at unraveling the receptor for B7H3 and developing new therapeutic measures. Research of the Max-Eder Junior Research Group Neurooncology of low grade Gliomas – set-up by Sevin Turcan in October 2016 at NCT- focuses on the role of IDH1 mutations in gliomagenesis (Bai Nat Genet 2016; Turcan Oncotarget 2013; Rohle Science 2013; Lu Nature 2012; Turcan Nature 2012). Studies aim at understanding the impact of an aberrant epigenome driven by mutant IDH1 on cellular states of glioma precursor cells, defining secondary mutations that cooperate with mutant IDH1, and developing new therapeutic approaches for gliomas that may contribute significantly to the treatment of this frequently lethal cancer. Future work of the CCU Neurooncology will focus on characterization, development and exploration of novel biomarkers for guiding therapeutic decision-making and their potential use in primary and metastatic brain tumors. From this and other research on targeted therapies, new molecules, and ultimately, points for therapeutic intervention will be developed. With the exciting data on multicellular brain tumor networks a new concept of growth and resistance of brain tumors has been established. Towards novel options of intervention, we will further explore the impact of these networks for brain tumor development and interaction with the healthy brain as well as its role in shaping the microenvironment. Weiler M, Blaes J, Pusch S, Sahm F, Czabanka M, Luger S, Bunse L, Solecki G, Eichwald V, Jugold M, Hodecker S, Osswald M, Meisner C, Hielscher T, Rübmann P, Pfenning PN, Ronellenfitsch M, Kempf T, Schnölzer M, Abdollahi A, Lang F, Bendszus M, von Deimling A, Winkler F, Weller M, Vajkoczy P, Platten M, Wick W. mTOR target NDRG1 confers MGMT-dependent resistance to alkylating chemotherapy. Proc Natl Acad Sci U S A. 2014;111(1):409-14.